Davey and Davo meet out in the bush. 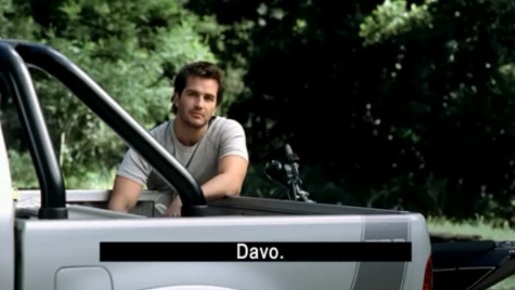 So how did Davo get Rachel to say yes to the new Hilux? He told her the Bilstein shocks reduced cellulite. Two mates get together at the wharf. Ventilated discs, Bilstein shocks, 17 ” wheels. What does the old man think about the young fella buying one? Two vehicles pull up the traffic lights. The younger guy wants to show off his speakers. The Pop-off valve makes da ladiez go wild. But how does that compare with the Hilux? The Toyota TRD Hilux campaign was developed at Saatchi & Saatchi Australia, Sydney, by executive creative director Steve Back, art director Eron Broughton, copywriter Steve May, account managers Ben Court and Amy Turnbull, and agency producer Ali Grant. Filming was directed by The McRae Brothers via Orange Whip Films, with producer Alex Mooney, and editor Danny Tait, The Tait Gallery. Sound was produced at Nylon Studios.